Astragalus Extract Full Spectrum and Standardized Botanical Immune Support Astragalus is one of the primary immune tonifiers of Chinese herbalism. Planetary Formulas Full Spectrum Astragalus features a concentrated extract of astragalus root, standardized to 0.4% 4′-hydroxy-3’methoxyisoflavone, one of the unique isoflavones of astragalus, combined with premium, whole astragalus root. The blending of this standardized extract with whole root ensures the presence of the full spectrum of astragalus constituents. Supplement Facts for 500 mg Serving Size: 2 tablets Amount %DV Calcium 64 mg Astragalus Root Extract 500 mg (standardized to 0.4% 4′-hydroxy- 3′-methoxyisoflavone 7) Astragalus Root (high grade) 500 mg Other Ingredients: sorbitol, dibasic calcium phosphate, colloidal silicon dioxide, stearic acid, modified cellulose gum, and magnesium stearate. 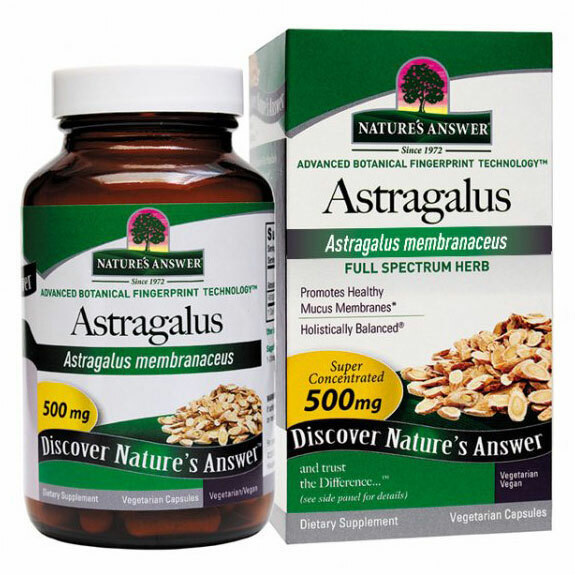 Warning: If you are pregnant or breastfeeding, consult your health care professional before using Astragalus product. Suggested Use: Two Astragalus Extract tablets twice daily, or as recommended by your health care professional. Astragalus Root Herb Encapsulated astragalus root harvested from the wild in northern China and Mongolia. Usage: Astragalus is considered to have a normalizing effect on the body’s functions. Astragalus is an important herb in Chinese medicine and is commonly included in Chinese cuisine. * Recommended Daily Dosage: Take 3 Astragalus capsules three times daily with water at mealtimes or prepared as a tea. If using as a supplement during recovery, dosage may be increased to three to four capsules four times daily. Ingredients: A mixture of Steroidal Saponins. Additional Ingredients: Gelatin RDA : Calories5, Total Carbohydrate1g<1%+, Dietary Fiberless than 1 gram3%+, Astragalus (root)1.41g** [% Daily Value], [+ Percent Daily Value are based on a 2000 calorie diet], [** Daily Value not established]. Disclaimer Statements contained herein have not been evaluated by the Food and Drug Administration. These products are not intended to diagnose, treat and cure or prevent disease. Always consult with your professional health care provider before changing any medication. Astragalus Liquid Full Spectrum, Alcohol Extract Supports Immune Resistance Astragalus is the primary botanical used in Chinese herbalism for supporting immune resistance. Not all astragalus is alike; its quality can range from extremely low to higher grade. 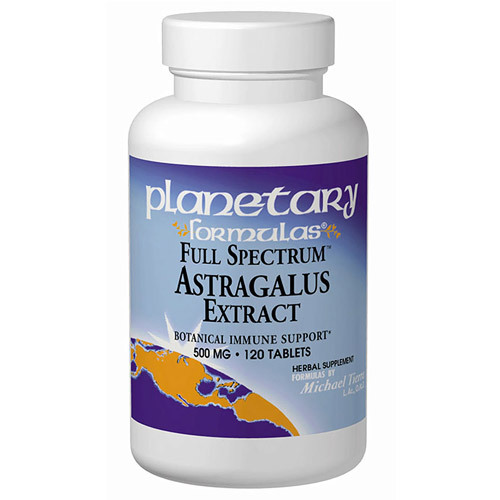 Planetary Formulas Full Spectrum Astragalus is prepared from premium grade astragalus roots to insure all the primary compounds of astragalus are present. Supplement Facts Serving Size: 35-40 drops Amount %DV Astragalus Root (Premium Grade) 35 drops (1 ml) Liquid Extract (1:2) Other Ingredients: grain alcohol (55%) and purified water. Warning: If pregnant or breastfeeding, consult your health care professional before using Astragalus product. Suggested Use: 35-40 drops of Astragalus liquid (approx. 1 ml) twice daily. 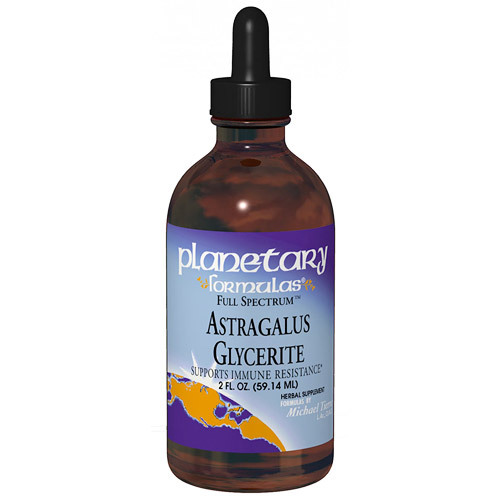 Planetary Formulas Astragalus Liquid is also available in Glycerine Extract, which is ideally suited for children or those wishing to avoid alcohol. Astragalus Liquid Full Spectrum, Glycerine Extract Supports Immune Resistance Full Spectrum Astragalus glycerine extract is prepared from the same premium grade astragalus as the Planetary Formulas alcohol extract. In order to capture the full range of constituents, the herb is first extracted in alcohol. The alcohol is then slowly evaporated off at a low temperature and reconstituted with pure vegetable glycerine. Glycerine extracts such as these are ideally suited for children or those wishing to avoid alcohol. Supplement Facts Serving Size: 35-40 drops Amount %DV Astragalus Root (Premium grade) 35 drops (1 ml) Liquid Extract (1:2) Other Ingredients: vegetable glycerine and purified water. Warning: If pregnant or breastfeeding, consult your health care professional before using Astragalus product. Suggested Use: 35-40 drops of Astragalus liquid, twice daily. Astragalus Jade Screen, Formerly Jade Screen Supports Immune Defenses Planetary Formulas Astragalus Jade Screen is a classic Chinese herbal formula (Yu Ping Feng Wan), which combines premium-grade Astragalus membranaceus with the Chinese tonics, atractylodes and siler. This is one of the most relied-upon formulas in Chinese herbalism to strengthen immune resistance. The ancient texts say this preparation will ‘protect you from the cold winds as if surrounded by a screen of jade.’ Modern research has confirmed the use of astragalus to support immune defenses and enhance macrophage activity. Supplement Facts for 850 mg Serving Size: 2 tabs Amount %DV Sodium 5 mg <2% Dietary Fiber 1 g 4% Calcium 145 mg 15% Proprietary Blend: 1.7 g Astragalus Root (Premium Grade), Atractylodes Root, and Siler Root. Other Ingredients: dibasic calcium phosphate, stearic acid, modified cellulose gum, acacia gum, colloidal silicon dioxide, and magnesium stearate. Warning: If pregnant or breastfeeding, consult your health care professional before using Astragalus Jade Screen product. 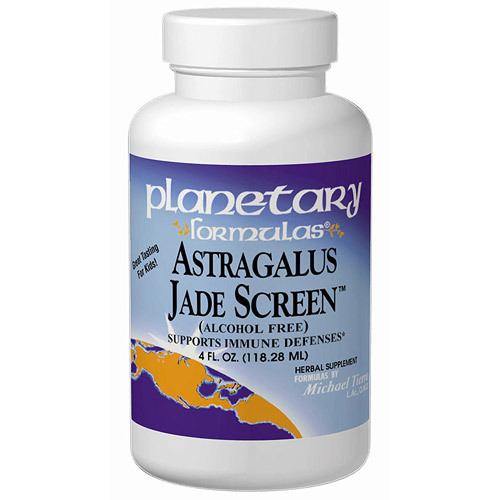 Suggested Use: 2 Astragalus Jade Screen tablets, three times daily between meals, or as recommended by your health care professional. Especially useful during the change of seasons. Astragalus Jade Screen Liquid Supports Immune Defenses Planetary Formulas Astragalus Jade Screen is a classic Chinese herbal formula (Yu Ping Feng Wan), which combines premium-grade Astragalus membranaceus with the Chinese tonics, atractylodes and siler. This is one of the most relied-upon formulas in Chinese herbalism to strengthen immune resistance. The ancient texts say this preparation will ‘protect you from the cold winds as if surrounded by a screen of jade.’ Modern research has confirmed the use of astragalus to support immune defenses and enhance macrophage activity. Supplement Facts Serving Size: 70 drops Amount %DV Proprietary Extract Blend: 2 ml Astragalus Root (Premium Grade), Bai-Zhu Atractylodes Root, and Siler Root. Other Ingredients: Glycerin, purified water, natural orange flavor, potassium benzoate, potassium sorbate, and citric acid. Warning: If you are pregnant or breastfeeding, consult your health care professional before using Astragalus Jade Screen product. Suggested Use: Adults 70 drops of Astragalus Jade Screen Liquid and children 35 drops twice daily between meals, or as recommended by your health care professional. You are currently browsing the archives for the Herbal Supplements category.